It is important to measure your results often to make sure you are on the right track. I don’t recommend judging proper thickness by feel or sight. The difference between 0.10mm and 0.16mm at the tip is impossible to see or feel, but the response and quality of sound with be comprimised if the results are off. Invest in a reed gauge to make sure you are getting it right. Probably the most common reed gauge is the perfecta reed, although Jeanne makes a nice gauge as well. The most critical measurement is at the tip of the reed. That part is also the easiest to measure because you can be sure of where to measure on the reed each time. You should aim for a tip measurement of either 0.09mm, 0.10mm or 0.11mm. Experiment to find the ideal thickness for your playing style. Anything much thinner or thicker will adversely effect the response. Whatever measurement you arrive at, the tip measurements must be absolutely consistent across the entire tip. If the tip is not even you will notice response and intonation issues that become worse in the higher registers. I mark all of my reeds lightly with pencil along the tip line of my profiler and take measurements along that line to make sure the measurements are consistent. 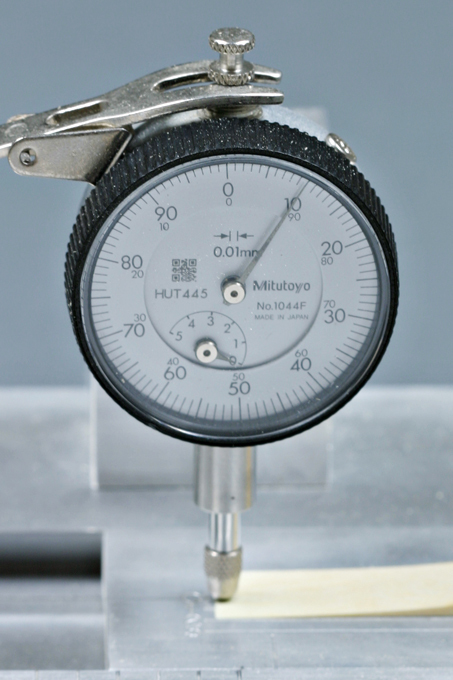 Adjust your profiler’s thickness control until you are consistently getting good results.